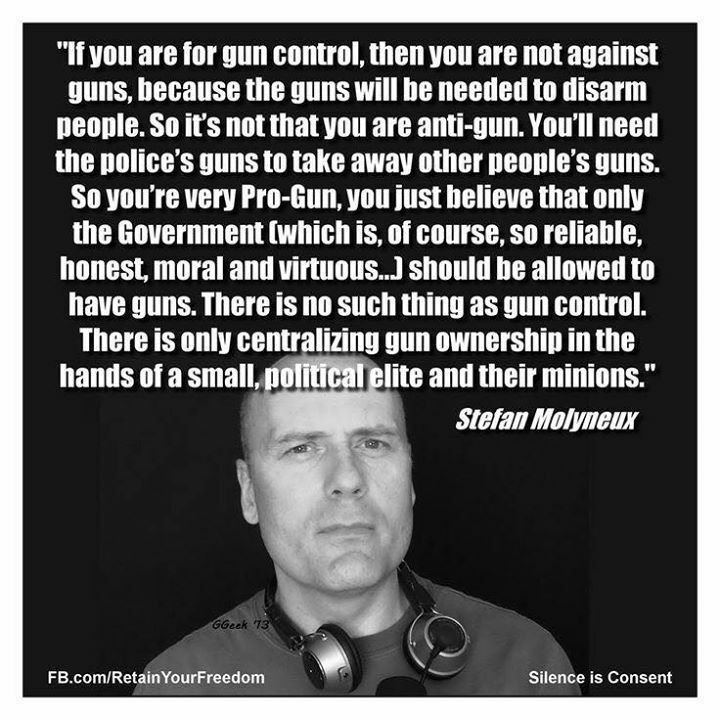 Gun control does not mean an elimination of gun ownership. 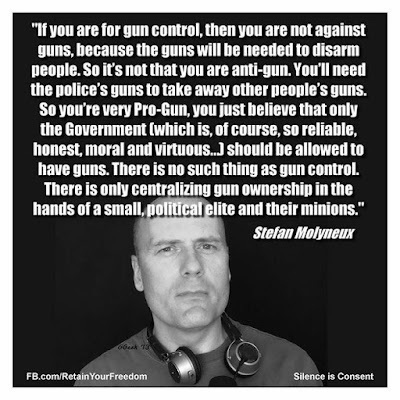 Gun control means setting reasonable limits to the types of firearms that can be owned and who can own them. 25 States allow anyone to buy a gun, strap it on, and walk down the street with no permit of any kind: some say it's crazy. However, four out of five US murders are committed in the other half of the country: so who's crazy?” Andrew Ford. Statistical distortion but still a fun fact.
" SHALL NOT BE INFRINGED "
It's illegal to own fully automatic weapons (except for a few Tommy guns that were grandfathered in). It's illegal to carry firearms into the offices of your Congress members and some other places. What we're really debating is not whether firearms should be totally banned or should be allowed without restraint but where to draw the line. An unconstitutional law is no law at all. "A well regulated Militia, being necessary to the security of a free State,....."
Curious how those rabid "shall not be infringed" folks seem to forget the first part of the Second Amendment. you left off the next segment of second amendment .
" the right of the people to keep and bear arms "
The second amendment gives 'the people' the right to own and bear muzzle loading flintlocks and swords. I interpret that sentence to mean the original intent of the 2nd amendment was to provide for the security of the individual states, a well-regulated militia was required, hence the right to keep and bear arms. If the states have a well-regulated militia (i.e. The National Guard), then the right to keep and bear arms can be infringed. This is the interpretation that has allowed for existing restrictions on who can and cannot possess certain types of guns. 3:07, regulated meant trained, skilled & willing to defend against tyrants. The Constitution restricted govt from delegating any delegated duty to others. There was no ATF, EPA, EPA, IRS, or Depts of tyranny in the delegated duties. Hence, those regulatory agencies are unconstitutional, not weapon parts & pieces. That's such an obviously erroneous meme argument. Suppose I support personal ownership of handguns and rifles, but not assault weapons? Whoops, I don't quite fit the meme's absurd paradigm. Radicals have a black-and-white view of a very gray world. In the meme's view, all guns are the same, and that claim is just so absurdly insulting to the person it's being told to, insulting to their intelligence. Sorry, no. Fact is, those who use firearms are criminals or hunters or recreationists. You see the hypocrisy is funny with Democrats in that when it comes to immigration Democrats don’t think about crime in the sense of exclusion, no they think of it as the Immigrant hasn’t committed a crime yet, so let them in. If Democrats applied the same logic to guns as they do immigration then Democrats would be saying you can have a gun it’s okay until you become a criminal then we take it away. In other words be consistent if you’re going to let immigrants in because immigrants haven’t done anything wrong yet, then you’re arguing on behalf of letting all Americans who are not criminals the ability to own whatever firearm they want until they commit a crime. Immigrant move to USA……. 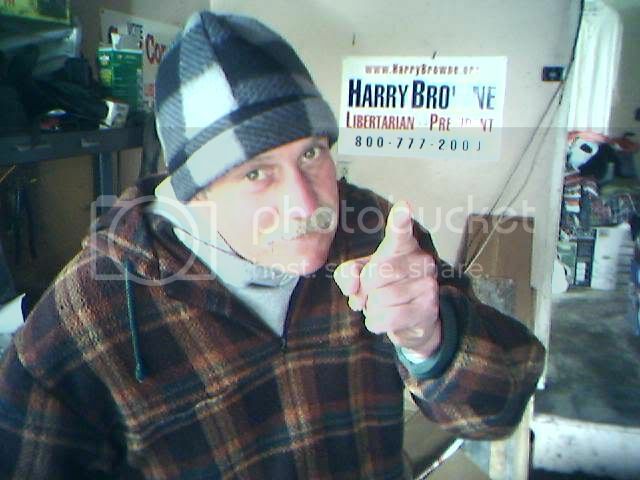 commit a capital crime…….. get kicked out. You nailed it HOJ. They do not want the Constitution to survive, they want to destroy it (which they can't, because it's a compact, not an "idealology"). Their intent is to turn America over to the UN which is run by Saudi Arabia, and all the enemies of our Constitution whom Congress keeps giving money to while the people fight amongst each other over political issues paid for by politicians to distract us. The media narrates what the politicians & lobbyists pay for.